Now that we are well into summer, thoughts turn towards the next school year. For many teachers, fall may bring a classroom full of new devices. While this is an exciting prospect, it could also be a paralyzing endeavor, particularly with the question: "Where do I begin?" Why not use an iPad, or any other mobile device, as a crutch -- quite literally -- to get started on a path toward innovation? I've been on crutches for the past few months. If, according to definition, "A crutch is a mobility aid that transfers weight from the legs to the upper body" (source: Wikipedia ), then why the negative connotations of using a crutch? Having broken my leg, I might have spent the past few months confined to a bed without this device. With crutches, however, I have support, access and mobility -- not unlike what can be gained with iPads. We would all like to provide constant, individualized support to our students 100% of the time; however, that is far from a reality in the classroom. Speak Selection lets students listen to text in eBooks, on web pages, or in any app where type appears. A student who needs to hear directions or questions read aloud can now do so independently, and a struggling reader can focus on comprehension, rather than decoding, since he or she can listen to passages. Numerous apps (Evernote, Notability, Audio Notes and Sound Note, to name a few) support audio recording. For students who struggle with output, the option now exists to record ideas directly "onto a page." Similarly, teachers can leave audio feedback for students who benefit from hearing input multiple times. With the built-in camera, students can quickly snap pictures of class notes on a board, or record a quick video of teacher instruction. Leveraging just these few features has the potential to personalize learning and differentiate instruction where it might otherwise be impossible. In addition to having near-instant access to the Internet, students with iPads also possess dictionaries, encyclopedias, calculators, graphing tools and atlases. Beyond print-based materials, they can watch videos, listen to audio, and even manipulate 3-D models. Without iPads, research and learning depend on immediately available resources. With iPads, students can potentially transcend time and space -- accessing primary source materials, curating content from their teachers or peers, and connecting with content in the modality that best suits their learning needs. Given their size, weight, dimensions, battery life and easy-on-easy-off nature, iPads are true mobile devices to be used anywhere and anytime. Like with a literal crutch, mobility then provides freedom. Students no longer need to confine their exploration and learning to the walls of the classroom or a computer lab. Having a student walking around with a laptop can be cumbersome (and even terrifying), but with an iPad, it could become the norm. The ultimate goal is not to walk with crutches but to walk without them. So, much like crutches support walking, iPads can buttress teaching. Once support, access and mobility become the norm, new ideas can form -- like using crutches as giant chopsticks to pick things up off the floor -- leading to innovation. Students read books, sing songs, draw pictures, and . . . go outside to take photos, shoot video of themselves offering explanations, collaborate with their teacher, and publish to a broader audience. 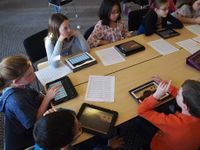 iPads provide the vehicle for innovation, allowing the students to make deeper connections with the content and the teacher to extend the learning context. Imagine creating a student-driven math class -- quite literally -- by passing around a single iPad. Chris Harrow began using AirSketch as a means to project his problem-solving notes onto student devices. However, because of its mobility, the iPad became the key to unlocking new ideas as he handed it off to the students in his class. As Chris describes on his blog, passing around his iPad suddenly created a student-driven learning experience where more of his students had opportunities to explore, hypothesize and take a leadership position in the class. What about when support, access and mobility allow for cross-grade collaboration? Teachers in two Chicago Public Schools -- Autumn Laidler, Kristin Zeimke, and Ben Kovacs -- developed a cross-school, cross-grade-level project where students both learned and taught each other. From the creation of research questions to reflection on their learning, iPads facilitated the undertaking, allowing the teachers to implement an innovative new curriculum where students created, collaborated and connected in order to deepen their understanding of bats as well as the research process. As Ruben Puentedura describes in his SAMR model, technology integration often begins as a substitution. In a similar vein, iPads (or any other mobile device) may initially be used as a crutch to get started on a path towards innovation. Have you tried taking advantage of the iPad's support, access or mobility benefits? Please share any experiences or thoughts with us.